A library is a necessity for any civilized neighborhood. After Spokane annexed Hillyard in 1924 the area qualified for more city services. One of the major services provided by the city, and a staple in twentieth century entertainment, was a public library. Residents in Hillyard attempted for many years to provide the public with free access to books. In 1908 the Hillyard Baptist Church opened space in their basement to the public for a reading room, but had only had a handful of books. In 1911 it was reported in the newspaper that the Carnegie Foundation had put up $10,000 for a public library in Hillyard, but those plans never panned out. Efforts were renewed in 1916 by the principal of Hillyard High School. He opened the school’s 2,000 books to the public for a couple of days a week in exchange for donations. This only whetted the public appetite for books. 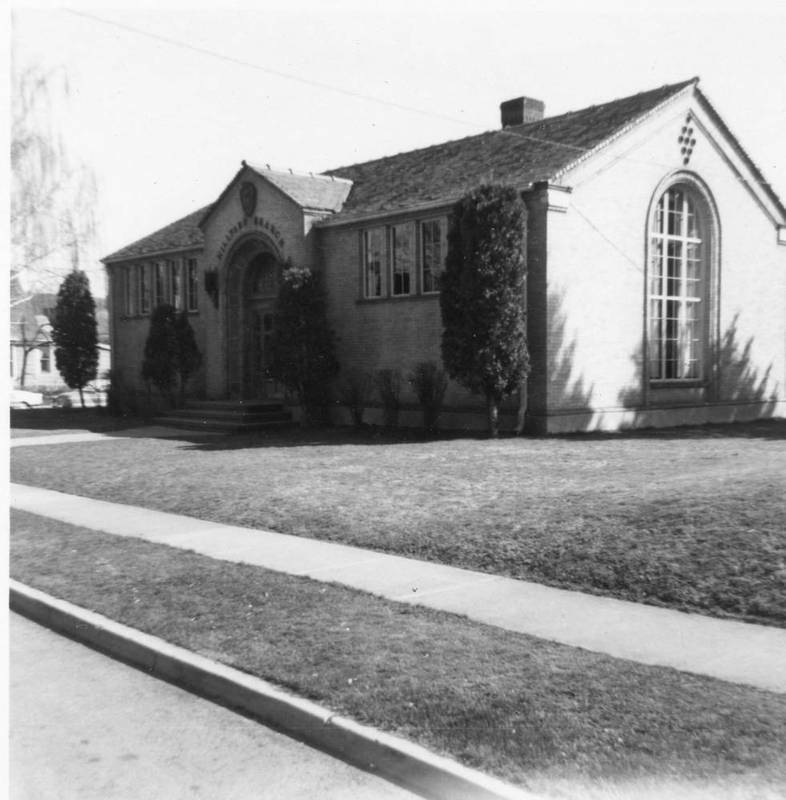 In the fall of 1928 the Spokane City Council appropriated $20,000 for a Hillyard Branch of the Spokane Public Library. The city hired Whitehouse & Price to design the building which was completed in December of 1928. Many Hillyard elites attended the opening gala of the library, including Agnes Kehoe. This library remained a pillar of the community and hosted a variety of events throughout the years. Always up on current trends, they even hosted a pet rock show in the 1970s. The Hillyard Library has remained mostly unchanged from its 1929 construction. Though the city abandoned the property in 1983 for a larger and more modern location, a school and later a church occupied the building until 2013. The building was recently put on the Spokane Register of Historic Places and will remain a fixture in the Hillyard neighborhood for years to come. Allie Honican, “Hillyard Library,” Spokane Historical, accessed April 20, 2019, https://spokanehistorical.org/items/show/602. Alexander, Dwayne W. Historic Register Nomination Form for Hillyard Branch Library, June 2015. Spokane Daily Chronicle, "Pet Rock Show Set at Hillyard Library," June 9, 1974. Spokane Daily Chronicle, "Branch Library Almost Ready," November 28, 1929.